Most people, if asked whether architecture should be attractive, would answer yes. It is a question that begs the answer. So we didn’t ask it. Instead, we showed three buildings in Moneglia, on the coast of Liguria, northern Italy, and asked which one people liked best. We refused to be drawn on why we were asking. Now we can come clean. We wanted to know whether people preferred buildings to have decoration and architectural detail or to be left plain and unadorned in keeping with the tenets of the Modern Movement. Given a direct contest, which would they choose? As announced, people in our mini-quiz have voted overwhelmingly for Building A (71%), followed by Building B (20%), with Building C trailing a poor third (9%). A and B are designed in what we might call a traditional style, with plenty of decoration and detail, whereas C is unashamedly modern, in the sense not only that it is new but that it respects the axiom, form follows function. Its theme is steels. Steels are the contemporary architect’s stock-in-trade. And since, to the contemporary architect, decoration is a bourgeois delusion, you might as well be honest, show your steels and leave it at that. The result is a building that people do not like. Even though Buildings A and B were criticized for having fake architectural detail, they still won the contest. ‘The two on the left (A and B, I assume) are apparently flat structures with unconvincing trompe l’oeil painting. I think that sort of treatment is OK on temporary scaffolding hoardings but rather irritating on a permanent basis especially if it turns out to be a cheap alternative to proper moulding that takes over from the real thing. ’The building on the right displays some mildly repellent cladding that I would expect to see on a US army base, although I suppose it is true to its era in a base kind of way. ‘It would be good to know what happens further up on the ‘modern monster’! Judging from these remarks, people preferred A or B largely for reasons of colour. The Ligurians are very good at colours: rich, deep reds, terracottas, dark ochres, sage greens, soft creams, vibrant pinks. Among our respondents there was a liking for architectural detail, too, but a reserve about it being painted on. 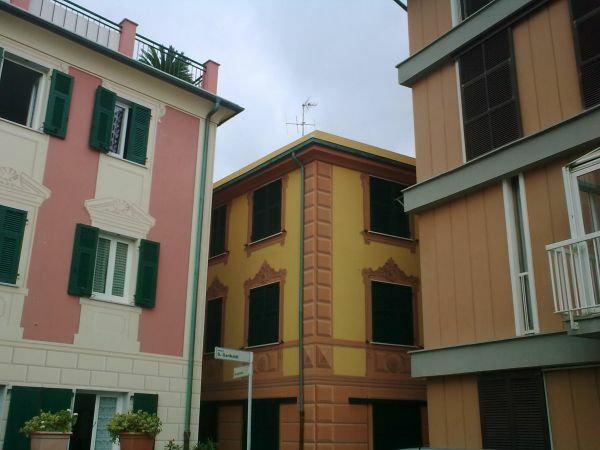 To answer a prevalent uncertainty, many buildings in Moneglia do use trompe l’oeil, including A and B. A few have stone and marble detailing, but this is not a wealthy town, so for most owners the cost has been and is prohibitive. Rather than leave their façades flat and lifeless, however, the people of Moneglia have chosen to paint on decorative window surrounds, pediments, architraves, panels, quoins and balustrades. Having spent two summer holidays in Moneglia, I can say with absolute assurance that I like it. This may be dismissed as an idiosyncratic viewpoint, but in my opinion detail pleases the eye and uplifts the heart. The purpose of decoration is to delight, and a town with a wealth of architectural detail is a place you can enjoy. If the hordes of tourists thronging the Cinque Terre and other Ligurian coastal towns are any guide, it is better to have trompe l’oeil detail than none. Few present-day architects, however, will countenance architectural adornment. They are taught not to. ‘Keep going, and eventually it will make sense,’ one student was instructed. Instinct told him the designs were ugly, but his tutors told him otherwise. It is a bit like composers of concrete and 12-tone music dishing up a diet of discordant screeching and expecting listeners to like it. Eventually they found themselves living in a self-righteous ghetto, with tiny audiences of purists. Now, thankfully, harmony and melody are returning to classical music, and no one has to listen to 12-tones if they don’t want to. Architecture, unfortunately, is compulsory. Once built, an ugly building blights the view for decades. Le Corbusier and the scions of the Modern Movement should now stand before the bar of history. It is time to dispute the fundamental principles on which they have been working for the past century. Their tenets are ultimately inhumane and degrading and have brought us an ugly world. Over the next few weeks we will be posting pictures of Moneglia and other pretty Ligurian towns in our Facebook page (see below) so you can judge the value of architectural trompe l’oeil for yourself. The first of these albums, Delights of Moneglia, is now on show, alongside the contrasting Delights of Swansea. You are welcome to add comments there or here.